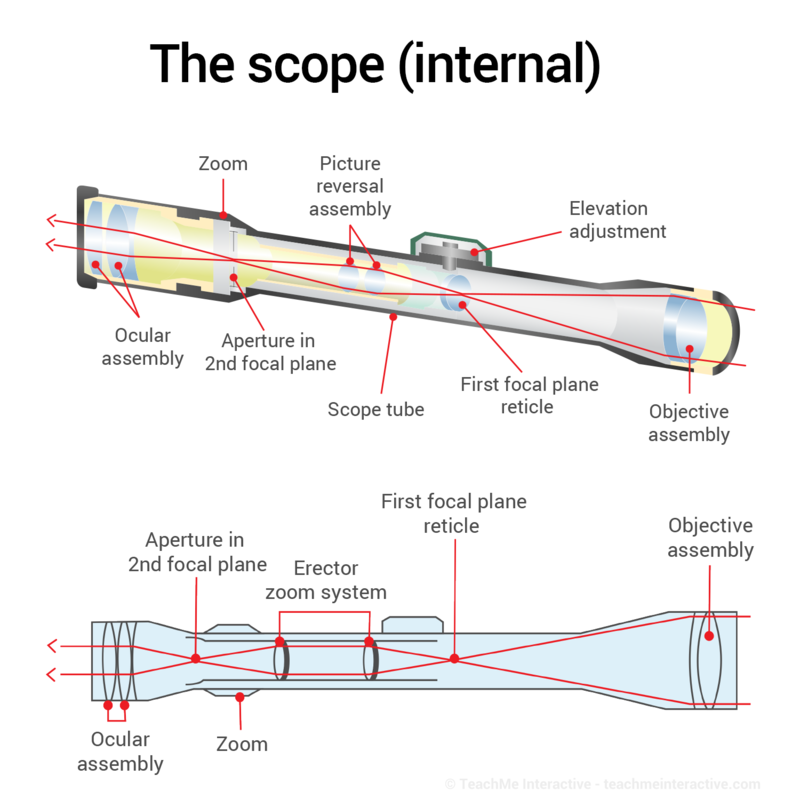 The inside of a rifle scope functions much like a telescope. In the front, there is a larger objective lens where light enters the scope body, and in the rear an ocular lens that focuses that light on the shooter's eye. From the eyepiece to the rear end of the scope, you have the ocular, magnification, focus, and objective lenses. 1. Objective lens assembly – The objective lens transmits light back to the ocular lens, and its diameter is measured in millimeters (i.e. 50mm). The larger the objective size, the more ambient light will be introduced into the scope and to your eye. 2. Focus lens assembly – The focus lens corrects parallax error by moving the focus lens toward and away from the objective lens. 3. Erector tube assembly – The erector tube assembly holds the magnifying lenses and reticle components. The erector tube functions to “erect” the image, i.e. forming an upright image. •	Windage/elevation: A spring system presses the erector tube against the bottoms of the windage and elevation screws. When the adjustment screws are turned inward, they push the erector tube against the spring system; when the screws are backed off, the spring system moves the tube. •	Magnification: When turning the power ring on a variable power scope, the magnifying lenses move within the erector tube to adjust magnification power. The magnification lens moves toward the objective lens when increasing magnification. As the magnification is lowered, the lens moves closer to the ocular lens. •	Reticle: The reticle may be placed in front of or behind the magnifying lenses, depending on the manufacturer. The former assembly is called a first or front focal plane (FFP) reticle, while the latter is a second focal plane (SFP) reticle. Lenses in a quality scope are coated, and fully multi-coated lenses are the best choice. 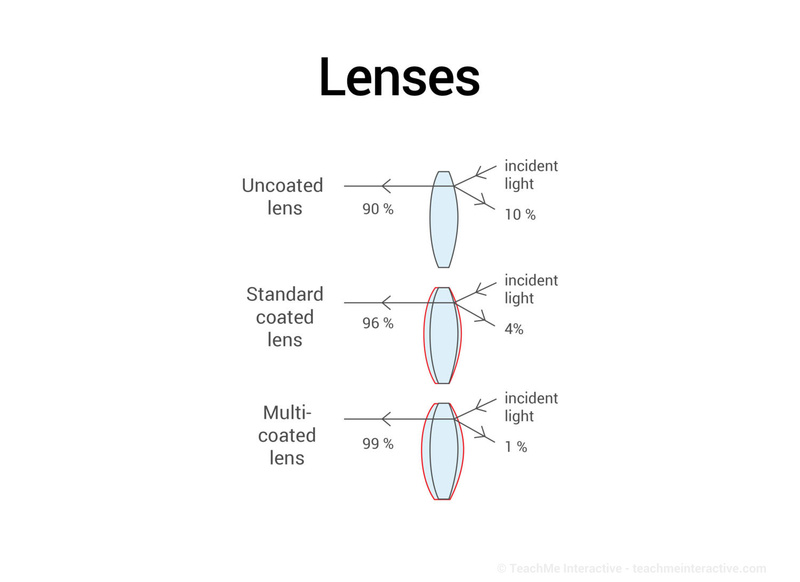 The optical coating on a lens maximizes light transmission into the optics, reduces the loss of light due to reflection, and adds some scratch resistance as well as reduced glare. •	Coated: There is at least one layer of protection on at least one lens surface. •	Fully coated: The scope has a single layer on all air to glass lens. •	Multi-coated: The scope has a single layer on all air to glass lens, with multiple coats on at least one lens. •	Fully multi-coated: This scope has multiple layers of coating on all air to glass lenses. 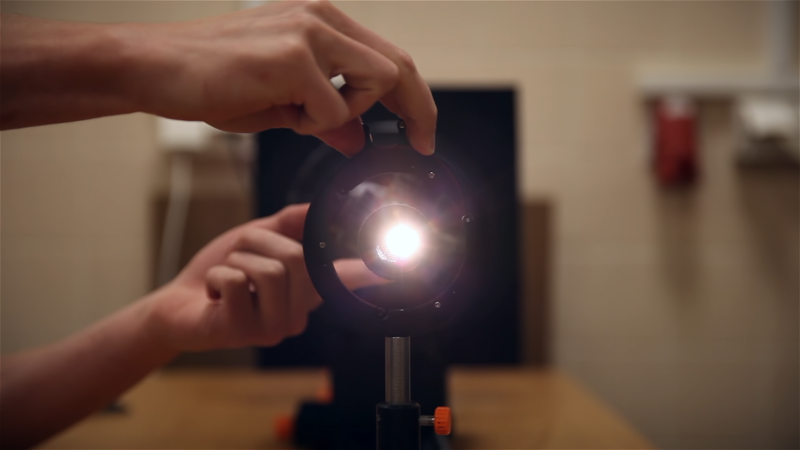 Scopes transmit light through the lenses to your eye and lose a portion of that light in the process. The very best scopes, and also most expensive, tend to have the reputation for having the best light transmission due to the coatings they use. 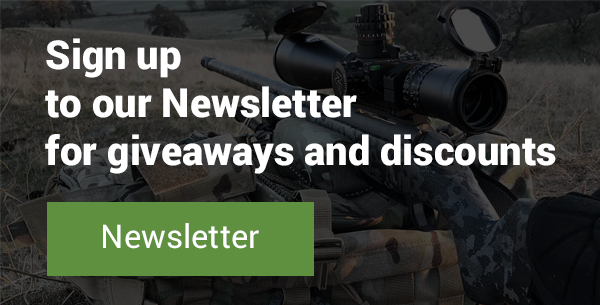 This is important for dawn and dusk hunting situations, typically also prime hunting time. Note: Coatings really make a difference in low light performance and not just the quality of the glass itself. A key component in scope reliability is the quality of the internal mechanisms. Many scopes market they have great “glass,” but this is negated by low-quality internal components. Reliability, repeatability and precision manufacturing are important considerations in choosing glass. Under ideal conditions, the very best riflescopes transmit slightly over 90 percent of the available light to your eye. There are very few scope makers that produce optics approaching these levels, and not surprisingly they are generally the most expensive models.